I once proposed that alligators saved all terrestrial life on earth. An adult alligator establishes a territory and digs a deep hole in a marsh or swamp where water pools deeper than in the surrounding environment. 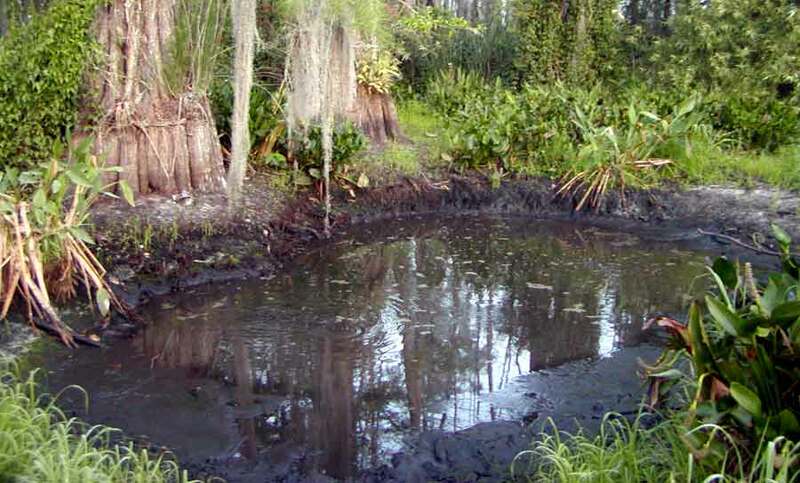 These gator holes help them survive droughts and cold fronts, and they also attract other aquatic animals such as fish, frogs, turtles, waterfowl, wading birds, raccoons and other mammals. Following the fiery K-T impact 65 million years ago, all the dinosaurs died, but crocodiles and alligators along with the animals that sought refuge in their holes, survived. Everything above ground literally cooked in the superheated atmosphere caused by the friction of asteroid fragments igniting oxygen. I shared my hypothesis with a paleontologist, but she was skeptical. She acknowledged that freshwater organisms suffered a lower extinction rate than dry land and marine species. However, she didn’t think my hypothesis was testable. Maybe, it’s an exaggeration to claim that alligators saved all terrestrial life, but ecologists agree they play a crucial role in fostering wildlife populations in the modern day world. Gator hole in the Big Cypress Preserve in Florida. The presence of alligators is beneficial for heron and egret rookeries. Herons and egrets nest in trees located in wetlands, particularly on islands surounded by alligator-patrolled waters. Alligators do feed upon the occasional nestling that falls from the nest, but they also take a heavy toll on raccoons, opposums, and even bobcats that would otherwise swim to the island, climb into the rookery, and feast on the eggs or nestlings. The herons in turn benefit the alligators because their manure fertilizes the water and this increases the abundance of fish. Heron rookery in Venice, Florida. 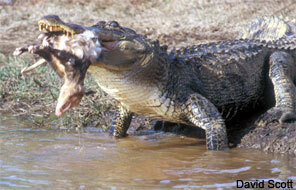 Alligator tearing up a possum. Possums are notorius egg-eaters. The great blue heron (Ardea herodias) is one of the most spectacular birds of America, and they are common–I see them quite often everywhere. Green herons (Butoroides stroutal) are supposed to be the most common heron, but I’ve only seen them a handful of times. Great egrets (Cameroides albus) are about as common as great blue herons, though they seem more tied to larger bodies of water. By contrast, I’ve seen great blue herons flying over busy highways and hunting in small creeks. Little blue herons (Egretta caerulea) are supposed to be uncommon, but I’ve seen them more often than I’ve seen green herons. I saw a yellow crowned night heron (Nyctocorax urolicea) for the first time this summer at Wakulla Springs, Florida. It was shy and ducked into the weeds. Great gray heron catching a European rabbit in the Netherlands. Great blue herons also prey upon rabbits and rodents. Audubon kept a great blue heron as a pet. His children were upset when it swallowed their sleeping pet cat. Yellow crowned night heron with a crayfish. Scientists studying the Clarks Quarry fossil site near Brunswick, Georgia expressed surprise over the relative lack of abundance of alligator fossils, though the site yielded plenty of remains of aquatic birds. Alligator fossils were found here, just not as many as one would expect. Random chance may explain why there were fewer alligator fossils than expected, but I recently realized a possible alternative explanation. Fossils from Clarks Quarry date to ~14,000 calender years BP. This was before sea levels and the water table rose to those of the present day. Between ~30,000 BP-~7,000 BP, swamps and other wetlands where alligators thrive were rare relic habitats. Moreover, winters were harsher and summers cooler, even in south Georgia during much of this era. Alligator populations were at a low ebb in Georgia during the Ice Age. Yet, they continued to live in low numbers wherever suitable habitat remained. Alligators withstood the fire of the K-T impact and the icy dry conditions of the Pleistocene. They are amazing survivers.